user warning: Table 'drupalgastronomer.comments' doesn't exist query: SELECT COUNT(*) FROM comments c WHERE c.nid = 173 AND c.status = 0 in /home/dgabriner/gourmetgastronomer.com/modules/comment/comment.module on line 992.
user warning: Table 'drupalgastronomer.comments' doesn't exist query: SELECT c.cid as cid, c.pid, c.nid, c.subject, c.comment, c.format, c.timestamp, c.name, c.mail, c.homepage, u.uid, u.name AS registered_name, u.signature, u.picture, u.data, c.thread, c.status FROM comments c INNER JOIN users u ON c.uid = u.uid WHERE c.nid = 173 AND c.status = 0 ORDER BY c.thread DESC LIMIT 0, 50 in /home/dgabriner/gourmetgastronomer.com/modules/comment/comment.module on line 992. Whenever I prepare rice, I tend to make more than I need. It's great to have a tupperware full of white or brown rice in my fridge, and my favorite thing to do with it is throw it in a pan and cook up some fried rice. The grain is so versatile, and wonderful served many ways - from the traditional Chinese egg fried rice to Thai fried rice to more colorful creations like my California-style fried rice or Spanish fried rice. Here are a few quick recipes, to help you cook up your leftovers. 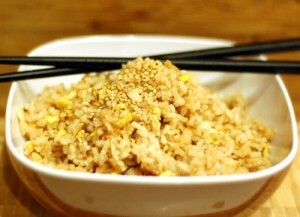 Basic Fried Rice: 1 large egg, beaten 2 Green onions or scallions, sliced 5 tbsp. peanut oil Left over rice (should be no less than 2 cups) 2 tbsp. soy sauce Heat 2 tbsp. of peanut oil in a wok or large skillet. When hot, add egg and scramble in pan, separating into small pieces. Remove egg and set aside. In excess oil, sauté green onion slices. Add remaining 3 tbsp. peanut oil, and add rice to pan. Stir well. Pour soy sauce over rice, mix, and add cooked egg. Voila! Variant #1 – Add panache If you desire more body to your rice, you may add fresh or frozen peas or carrot slices to the pan when cooking the green onions, and follow the recipe from there. For a meatier version, you may add pre-cooked, cleaned shrimp at the very end, when you add the egg, to prevent overcooking. Chunked, cooked chicken may also be added. Variant #2 – Thai flavor 1/2 white onion, sliced into strips 2 tbsp. Thai fish sauce 1 cup chunked pineapple Left over rice (should be no less than 2 cups) 1/2 cup washed, coarsely chopped cilantro Sliced cucumber, for garnish To give your rice a Thai flair, consider adding Thai fish sauce. About 2 tbsp. should add enough flavor to permeate your rice. For an even more dynamic fried rice, add slices of white onion as you are frying your green onion. Cook until translucent, and then add chunked pineapple to the pan, followed by white rice. At the end of the cooking process, about one minute before removing rice from the pan, add chopped cilantro and mix into the rice. Garnish with cucumber rounds. Variant #3 – California style 2 tbsp. olive oil 1/2 red onion, diced 1 clove garlic, minced Fresh thyme, chopped 3 sun dried tomato pieces in oil, sliced (important – must be prepared in oil to be soft) 1/2 cup sweet corn kernels Left over rice (should be no less than 2 cups) 10 leaves fresh basil 1/2 cup feta cheese Sauté onion and garlic in olive oil over low heat, until translucent. 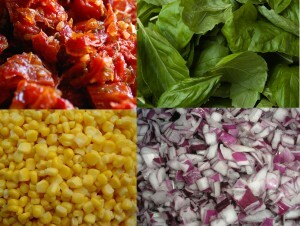 Add thyme, sun dried tomato, and sweet corn. Stir and cook until heated. Add rice and mix well. Turn off heat, add basil leaves, and mix. After mixture has cooled a little, stir in feta cheese. Top with ground black pepper and enjoy. Variant #4 – Spanish 2 tbsp. olive oil 4 crimini mushrooms, sliced 3 cloves garlic, minced 1 tbsp. cumin powder 1 tbsp. chili powder Salt and pepper to taste 1 russet potato, cubed and cooked 1 can diced Anaheim chilies (or substitute your favorite chili pepper here) 5 pitted green olives, sliced Left over rice (should be no less than 2 cups) Grated manchego cheese (cheddar may be used instead) Fresh ground black pepper Sauté crimini mushrooms in 1 tbsp. olive oil and set aside. Add remaining oil, minced garlic, cumin, chili powder, and a dash of salt and pepper to the pan. Fry until garlic is cooked but not brown. Add cubes of cooked potato to the mixture, and toss until coated. Stir in chili pepper and green olives. Add rice and mix well. Once mixture is heated completely, top with grated manchego and black pepper. Serve immediately.